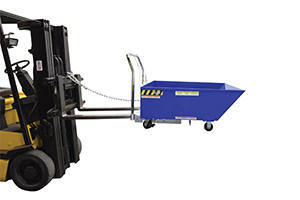 This unique product has been designed to function as a parts hopper that may be dumped with the assistance of a fork truck. The low-profile design allows the hopper to be placed underneath machinery to be used as a catch basin for parts. 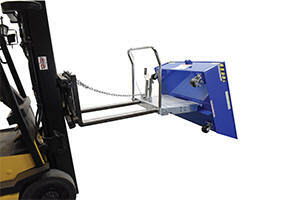 The newly designed hopper reduces the hazards, inconveniences and time when collecting parts off the floor. 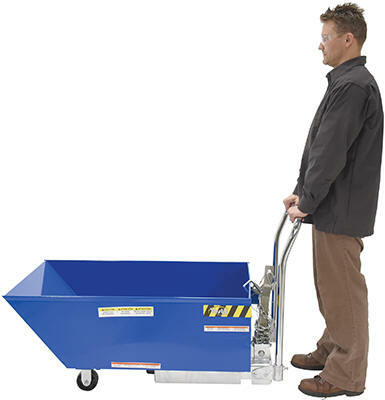 This 1⁄2 cubic yard, 10 gauge, parts hopper has fork pockets for dumping the hopper 90° with a fork truck. 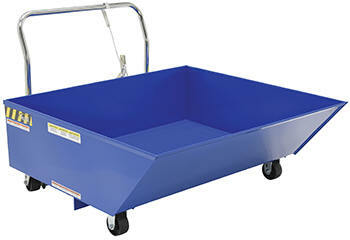 HOP-LP rolls smoothly on (4) 4" x 2" glass filled nylon casters (2) rigid, (1) swivel, (1) swivel with brake and, HOP-LP-N on (3) wheels (2) rigid and (1) swivel with brake.Includes a removable push handle. Once the material is dumped, the hopper will return to the locked position when lowered to the ground. 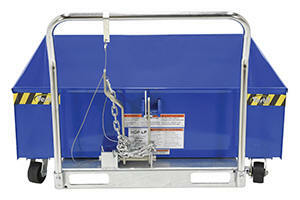 Blue baked-in powder coated finish for superior protection. Options, including leak proof chute welds, model LEKP, 3/4" drainage plug, model H-DPLG-75, and 2" drain plug model H-DPLG-2, leak proof chute welds included with drainage plugs.